When you really love your car, detailing and car care is more of a fun hobby than a necessary chore. To get the most benefit out of your Presta Paint Refinishing and Car Detailing Products, we encourage you to check out some of our Tech TIPS and Instructional Videos. Here, you'll learn valuable tips, techniques and helpful hints that will help you achieve maximum results and get the flawless finish and outstanding shine that you've been looking for. 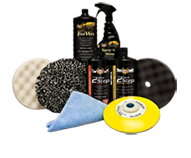 Find tips, tricks and helpful hints about how to use your Presta car detailing and paint refinishing products. See video demos of many of Presta's top-selling products in action. Stay up on the latest news and happenings at Presta. Sign up for our eNewsletter today!